Popping into Clerys last night for ‘a quick look’, I was waylaid by the divinely scented Roger & Gallet stand, a brand that has really impressed me over the past few months. Firm French favourites – the company is the No 1 perfume brand in France - Roger & Gallet launched onto the Irish market last year and is slowly but surely building up a devoted fanbase on these shores. In particular their Huile Sublime Bois d’Orange, a gorgeous dry body oil that I wrote about here, is developing a cult following thanks to its hardworking, multi-tasking ways and zesty orange scent. The company has a long and distinguished history, creating the first perfumed round soap back in 1879. Their products have perfumed the likes of Napoleon III, Queen Victoria and the Spanish royal court. Roger & Gallet are also big believers in aromachology, a science that studies the influence of scents on our behaviour and mood. The natural essences and essential oils in their products are intended to lift the spirits with Bois d’Orange working to invigorate, citron (my favourite!) to energise, rose to relax, ginger to stimulate and green tea to soothe. Alongside the perfume, the brand also offers a full range of soaps, shower gels and lotions as well as what is rapidly becoming my favourite handcream, ever. Prices are brilliant for the quality of the products, too: perfumes retail from €17 for a 30ml bottle or €39.00 for 100 ml; soap sets are €13.50; the hand cream is a snip at €9, while that lovely dry oil is just €11 for 30ml, or €25.00 for the 100ml bottle. Have you tried out anything from the range? Roger & Gallet is available from pharmacies nationwide – including McCabes on the ground floor of Clerys, Dublin. 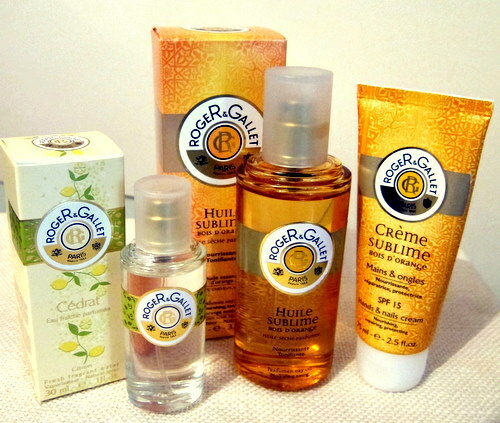 I love Roger & Gallet. I've the dry oil and the hand cream on the go at the minute. Joey want. Must have. Will get. Is this also where one gets Nuxe? First I heard of this, it all sounds lovely!